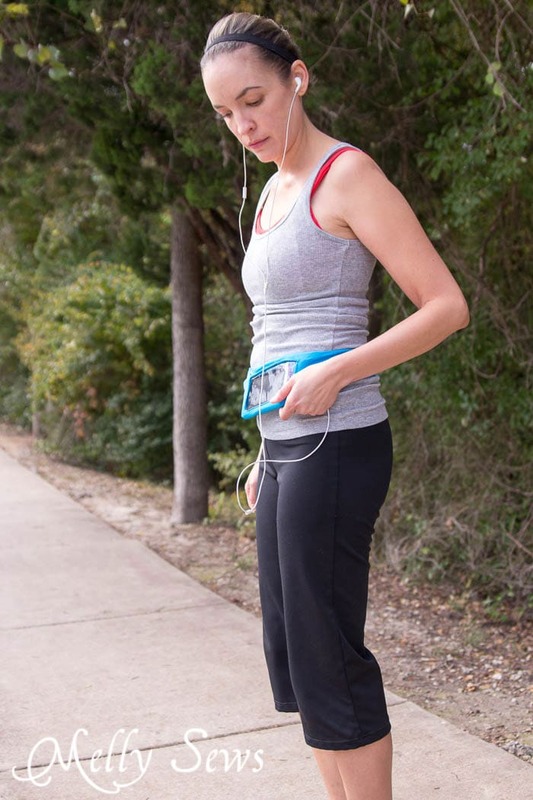 Hey y’all – today I’m sharing this tutorial for a running belt with a window for your phone – so you can skip a song or answer a call without taking the phone out of your belt. I’ve been a runner for a very long time now, but if you had asked me about this when I was in high school, I would have laughed and laughed! I HATED to run back then. So how did I go from that to being a regular runner? The difference was that I discovered that I had to remove the competition from it. I am slooooow. I don’t run fast, and I don’t think I ever will. But as an adult, I realized that going faster or further or longer than someone else just isn’t the point. For me, the chemicals from running quite honestly probably keep me off mental health medications; the physical fitness upside is just icing. And I love to listen to music or watch my iPad while running. When I run on the treadmill, it’s easy to put the iPad on the ledge of the machine, but it’s another story when I venture to run outside. Quite a while back, I made myself an iPhone armband, and that worked well, except I used it so much it disintegrated. Also, the band would slip down my arm sometimes. 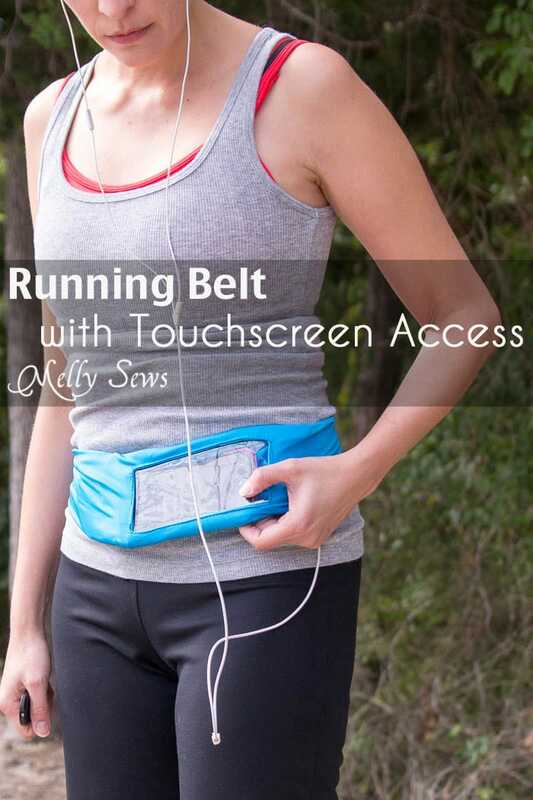 So when I saw Erin’s post about her running belt, I thought that was genius. There were just 2 problems: 1) I wanted it to be easier to get off and on and 2)I wanted to be able to access my phone without having to take it out of the belt. So, I’m going to refer you to her tutorial for some steps, and show you how I solved my two issues with others. Athletic fabric. You’ll need it to be the length of the measurement on your body where you want the belt to sit; for me this is between my waist and hips. It will need to be twice the height you want the finished product to be, plus a couple inches. You’ll also need to cut a pice a couple inches wider than your phone and the same height as your larger piece of fabric. A small piece of vinyl, slightly larger than the size of your phone screen. Sew on velcro, about 6 inches. I used 1 inch wide, but I wish I had wider, so I’d get this (affiliate link) if I make another one. 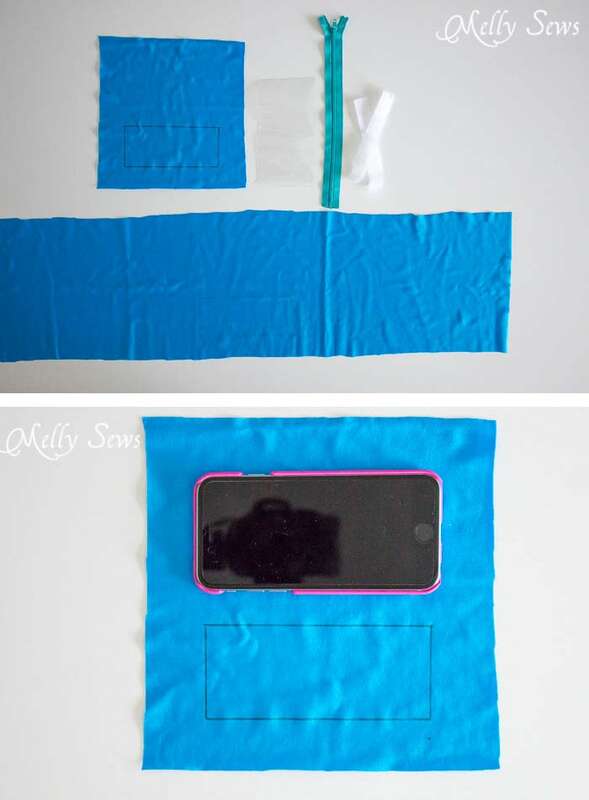 Trace out a rectangle on the wrong side of the smaller piece of fabric that is 1/2″ smaller all around that your phone. So for example, if your phone is 3 inches by 6 inches, make your rectangle 2 1/2 inches by 5 1/2 inches. 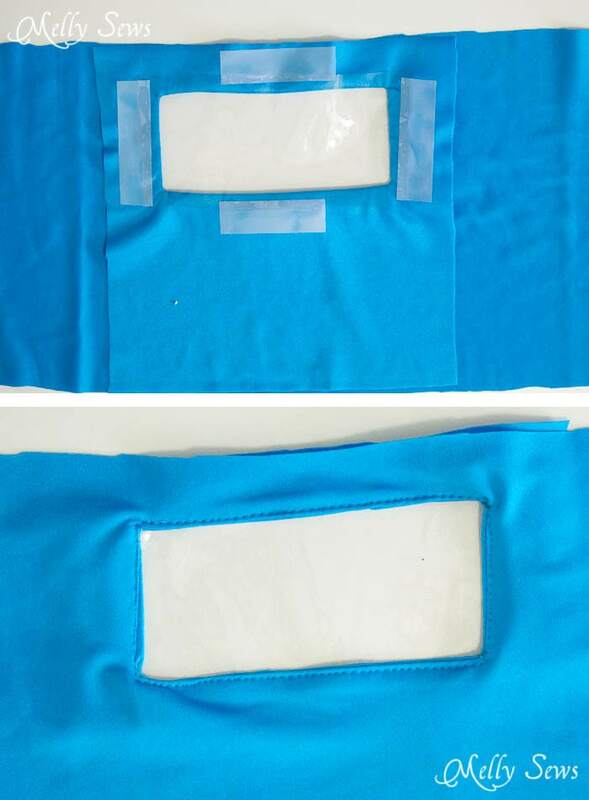 Make sure your rectangle marking is centered widthwise on the smaller piece of fabric, and at least 1 inch away from the edge, as shown above. Place smaller piece of fabric on the belt piece, right sides together. Stitch around the rectangle marking through both layers. 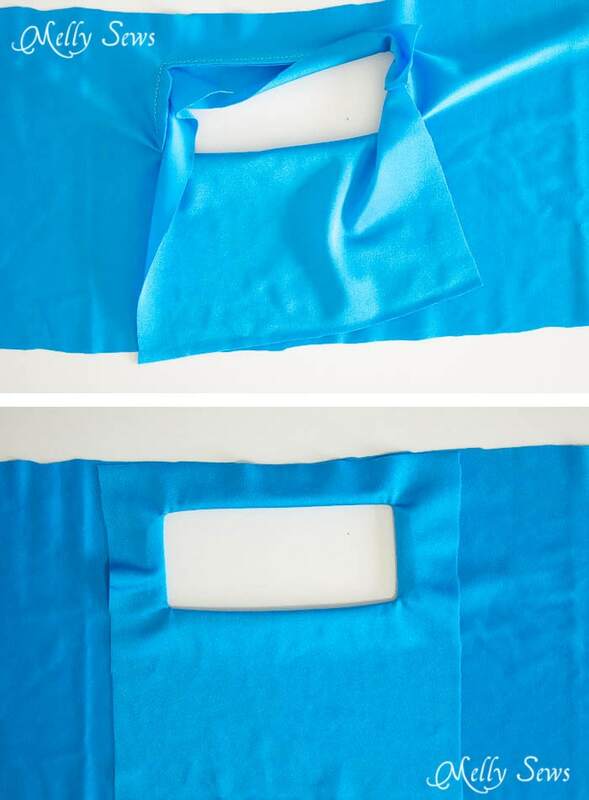 Cut the inside of the rectangle out, leaving a 1/4″ seam allowance and clipping into the corners, as close as you can get to the corners without clipping through the stitching line. Turn the fabric through the hole to the wrong side. Press the fabric (make sure to check your heat settings so you don’t melt the fabric). 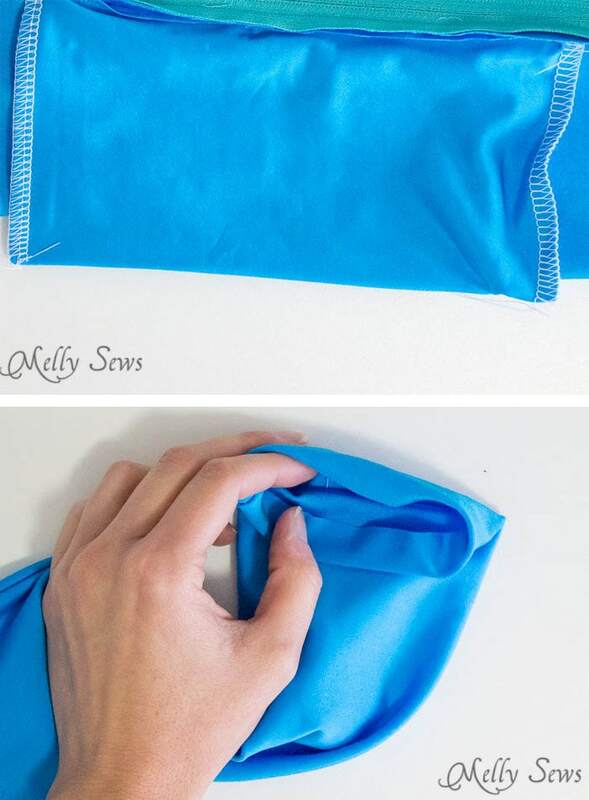 Cut the vinyl to 1 inch wider all around than the opening in your fabric. Tape the vinyl to the inside of the window. You could also use wonder clips to hold it in place, just don’t use pins. On the right side, stitch around the window to secure the vinyl to the belt. 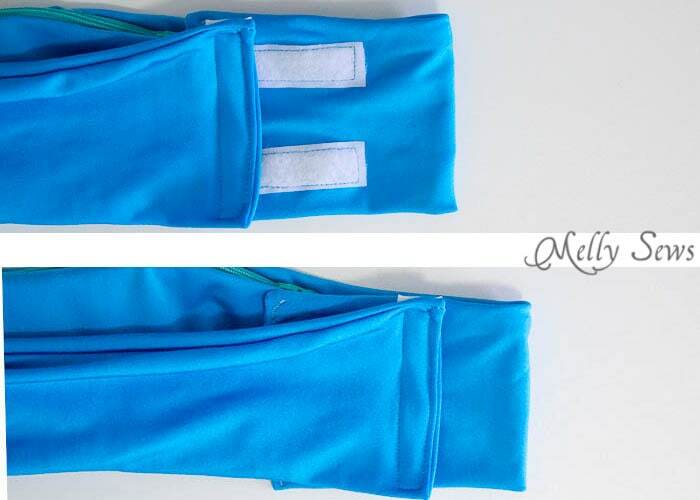 Follow the tutorial from Erin’s belt to install the zipper and sew the belt into a long tube, then stop there. When you sew the zipper, make sure to catch the fabric from the belt and the pocket piece on each edge. 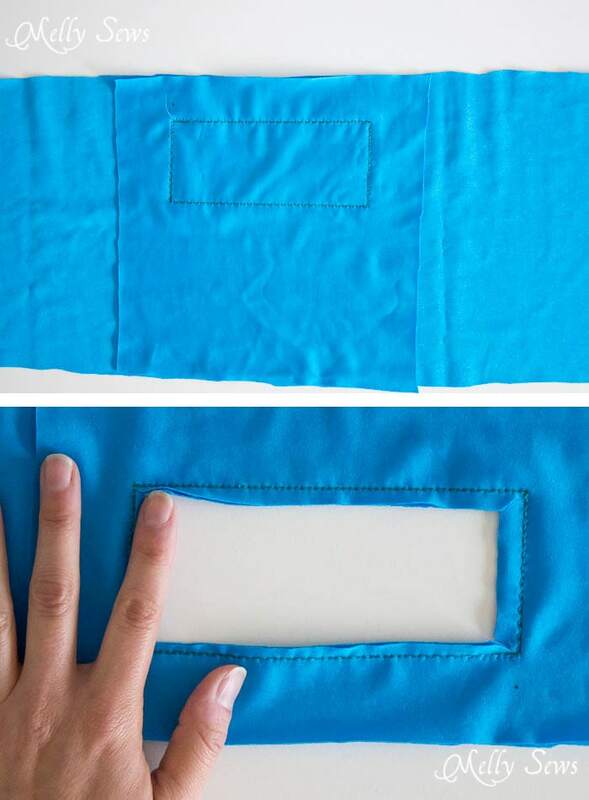 Sew up the sides of the phone pocket. Turn your belt tube right side out. At each end of the belt, push the fabric to the inside about 1/2″. Pin the ends of the belt closed. On one end, stitch the hook side of the Velcro vertically on the inside of the belt. Sew the other end of the belt closed. Cut the loop side of the Velcro strip in half, then sew the two strips horizontally on the outside of the belt on this side. 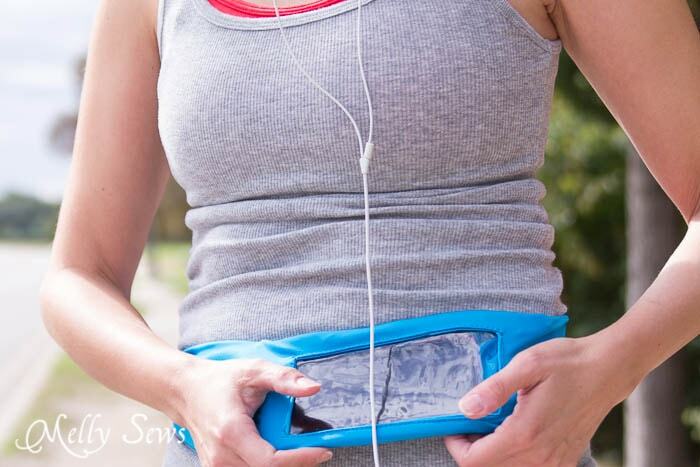 This lets you adjust the belt as you lose weight to make it tighter. I didn’t choose to put the FOE on my belt edges like Erin did, but if you wanted to, you’d follow her tutorial for doing so. And then strap that puppy on and go for a run at whatever speed you go. 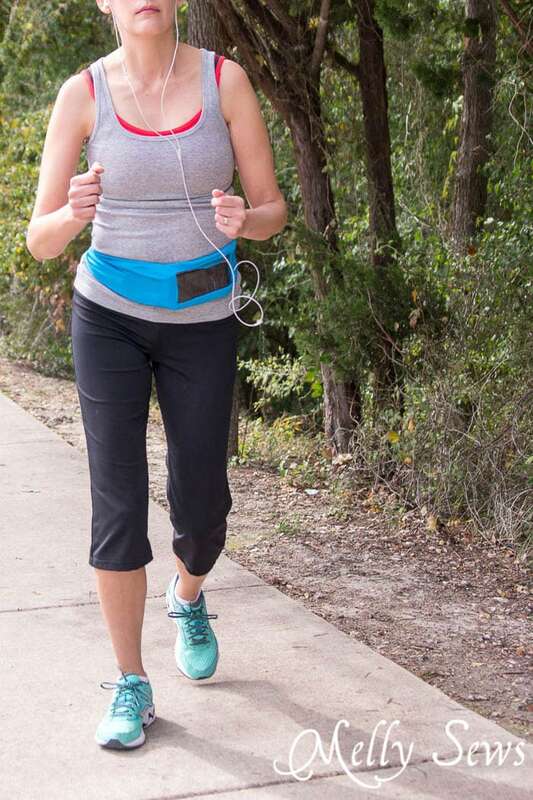 PS – while we’re on the subject of running – I’m wearing this running bra (affiliate link) which I love because it keeps the girls from bouncing around while running or horseback riding. And I also appreciate that it comes in band sizes down to 30 and cup sizes up to DD – definitely preferable to S, M, L sizing that I find in many, many other sports bras. Love this! I have one I bought, but it needs this window! Thanks! 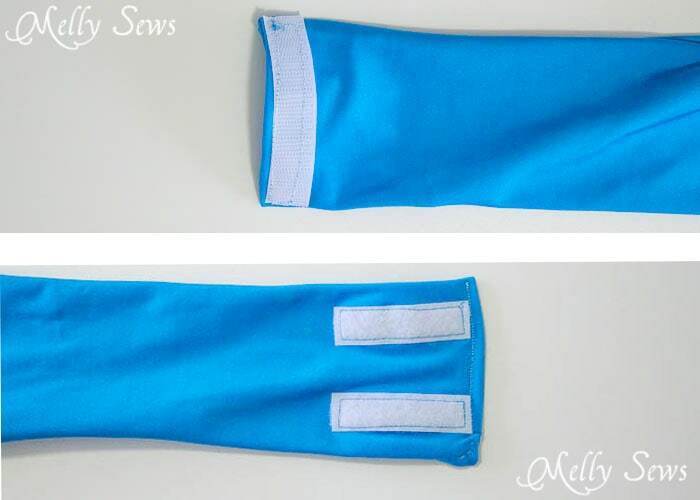 I was going to buy a flip belt, but will sew one like yours first, as I love the idea of see through (as my purchased armband is now) I love to run and I love to sew. Thank you for writing your blog and sharing your expertise. Most appreciated. I love this idea. I recently joined a gym and would really love to have a holder for my phone, ID, keys… I am totally going to make this. Thanks so much for an excellent idea and tutorial. Genius idea! 🙂 Thanks for linking to me.